The Treasure State has a long history of bringing its rare and precious buried materials from the Earth’s bowels to its skin to share with global industries. Our timber industry has also blessed the world with raw materials for homes, furniture, paper goods and fuel. Once these precious metals such as gold, copper, lead, zinc and silver become machines and infrastructure, our woody biomass has been converted into napkins, and our coal, oil and gas have become plastics, lubricants and fuels, where do they go? As we are well aware, the combusted carbon fuels find their way to the air and ocean, along with an alarming amount of plastic. But what of your used tree-sourced tissue? Your gold-mined cellphone? Your oil-originated grocery bag? As Montana’s economy continues to grow and our technologies continue to evolve, so do the number of challenges surrounding the fate of our waste. But today, as Missoula poises for a thoughtful dive into a citywide plan to reduce what goes into our local landfill by 90 percent by 2050, opportunities abound. Missoula has the brains, the will and the commitment to make great progress during the next 32 years to meet the goal. Five years ago, as director of the Missoula College Energy Technology Program, I was awarded a portion of a$25 million Department of Labor grant. A portion of this grant funded a Recycling Technology Certificate, which now boasts several graduates who have launched their own zero-waste careers in Missoula. Oreo’s Refininghas been processing e-waste for two years, keeping rare earth metals from being illegally shipped overseas into dangerous and polluting practices. Missoula Compost Collection’s Sean Doty also holds a certificate in Recycling Technology and is currently diverting several tons of organic waste away from the landfill and back toward the Garden City’s gardensand farms. Why throw glass in the landfill when it can be used in roadways? Why not turn plastics into construction materials? A Zero Waste economy supports a local economy and opportunities abound. Waste is of course inevitable, and since there is no “Planet B,” we are now compelled as a global civilization to invent useful and lucrative solutions for dealing with our mounting solid waste conundrum. Missoula’s Zero Waste Bucket, formed in 2014, has been grappling with the issues that made it to a City Resolution and then to ZERO by FIFTY: Missoula’s Pathway to Zero Waste plandebuted at the Missoula City Council this week. On a local level, Logjam Presentsrecently got on board with the ZERO by FIFTY plan by recycling and diverting the waste from its concert venues. 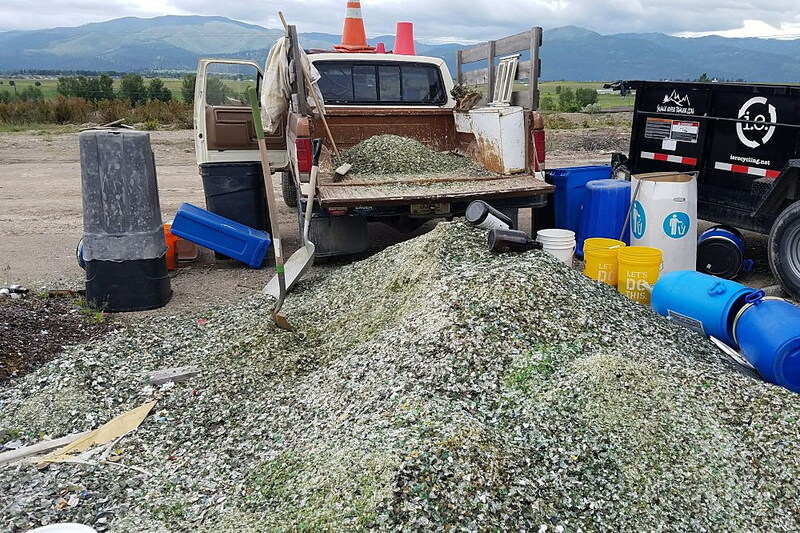 I was recently able to connect Missoula’s only curbside glass recycling company, Intergenerational Equity, with potential new markets for more than 10 tons of backlogged bottles with Diversified Materials, which will begin experimenting with washing post-consumer-waste glass for resale. These are just a few examples of ingenuity and innovation that are framed, fostered and will flourish with the guidance and intention set ZERO by FIFTY: Missoula’s Pathway to Zero Waste. This type of work will no doubt be challenging, but it is a fun challenge that other industries, especially manufacturing and construction, can begin to adopt as we move towards Zero Waste by 2050. I was encouraged and excited thinking about the possibilities by the initial presentation of ZERO by FIFTY in the Parks and Conservation Committee of City Council this week. The discussion was so rich, that it was carried over to next Wednesday, August 1st@ 11:35 in the City Council Chambers. I encourage each of you to check out the details, learn more and join our community in this positive initiative with economic, environmental and social benefits. Bradley Layton is a licensed professional engineer, entrepreneur and affiliated faculty member at the University of Montana. His latest book, Zero Waste in the Last Best Place, is available for purchase in person, iUniverse, Amazon, Barnes & Noble, and at all Missoula bookstores. August 2: Climate Smart Monthly Meetup: Water + Climate,Imagine Nation Brewing Community Room. 5:00-7:00 p.m.
August 2: Meeting of Community Advisory Group on cleanup of the closed pulp mill near Frenchtown, All welcome. EPA will provide a briefing on current status. Frenchtown Fire department. 6 p.m.
August 7: Float for the Fork: Float & River Cleanup,Join Western Cider & Clark Fork Coalition to clean the urban stretch of the Clark Fork River. Volunteers can then relax with a cold cider and yummy food from local food trucks. 5:00-8:00 p.m.